Earlier this year UK police began working with rightsholders on a campaign to shut down file-sharing sites. Many site operators received warnings that their activities were breaching copyright law as well as the UK’s Serious Crime Act. The actions yielded some success as a few smaller sites closed their doors. However, the major targets were unfazed by the police demands and continued business as usual. 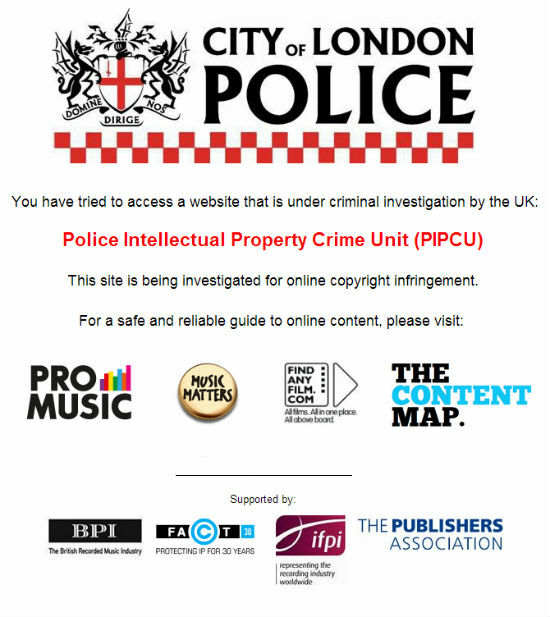 This week the newly founded Intellectual Property Crime Unit (PIPCU) of the City of London Police stepped up its efforts and instead of targeting the site owners, they contacted their domain registrars. In a carefully worded letter the police warn that the sites in question may be copyright-infringing. 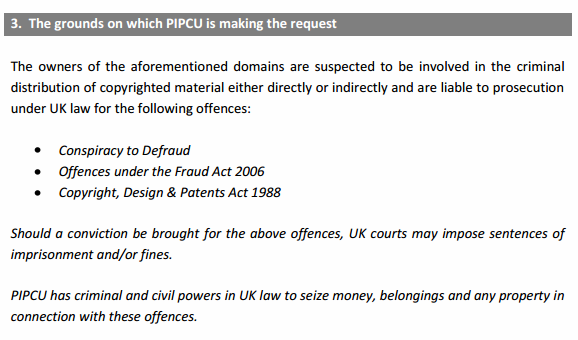 “The owners of the aforementioned domains are suspected to be involved in the criminal distribution of copyrighted material either directly or indirectly and are liable to prosecution under UK law for the following offences: Conspiracy to Defraud, Offences under the Fraud Act 2006, Copyright, Design & Patents Act 1988,” the letter states. There is no reference to an active court order that requires the registrar to take action, but the police unit instead points at the obligations the registrars have. Among other things, the letter lists a possible breach of ICANN policy and a violation of the registrars’ own Terms of Services as a validation for the suspension. The letters were sent to the registrars of dozens of domain names and the fallout is already visible. TorrentFreak spoke to the owner of SumoTorrent.com who confirmed that his domain was suspended yesterday. The site quickly moved to SumoTorrent.sx, but lost a lot of traffic in the process. MisterTorrent.me was also suspended after the registrar received the police letter, and ExtraTorrent’s .com domain presumably suffered that same fate. With millions of visitors a day ExtraTorrent is the biggest casualty so far. TorrentFreak talked to the operator who couldn’t yet confirm that City of London Police are behind the suspension, but this seems very likely. For now the site has moved to ExtraTorrent.cc which is still operational. Not all domain name registrars are blindly complying with the demands of the Intellectual Property Crime Unit. Canada-based easyDNS is refusing to suspend TorrentPond’s domain, describing the police request as overbroad and unfounded as there is no hint of due process. “Who decides what is illegal? What makes somebody a criminal? Given that the subtext of the request contains a threat to refer the matter to ICANN if we don’t play along, this is a non-trivial question,” easyDNS’ CEO Mark Jeftovic responds. “Correct me if I’m wrong, but I always thought it was something that gets decided in a court of law, as opposed to ‘some guy on the internet’ sending emails. While that’s plenty reason enough for some registrars to take down domain names, it doesn’t fly here,” he adds. “Suspension of the domain(s) is intended to prevent further crime. Where possible we request that domain suspension(s) are made within 48 hours of receipt of this Alert. In respect of the information provided by us, we respectfully ask you to consider your liability and the wider public interest should those services be allowed to continue,” the letter states. In addition, the registrars are being asked to effectively send the traffic of the torrent sites to a landing page with the City of London Police logo, as well as the logos of their entertainment industry partners. Again, all without citing a court order or specific legal mandate. “We request that the aforementioned domain(s) are redirected to the PIPCU Warning Page located at IP address: 83.138.166.114,” the letter notes. TorrentFreak asked the City of London Police for the comment on their latest actions but we have not heard back from them. It’s clear, however, that the cooperation between the entertainment industry and UK law enforcement is serious. Whether the impact will be lasting has yet to be seen. Update: The emails were sent to registrars of other “pirate” sites as well, including emp3world.com, full-albums.net and maxalbums.com. We will update this article when more information comes in. Update: ExtraTorrent confirms that their domain troubles are related to the same issue. “Our registrar and with no court order or due process got scared of the London Police email and did suspend the domain. We are communicating with the registrar to find a logical solution to this chaos,” TorrentFreak was told.